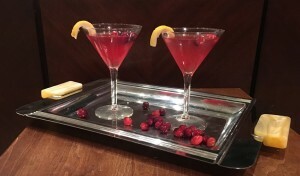 Get into the holiday spirit with this simple but spicy cranberry cocktail! Fill a shaker with ice, add Vodka, Ginger Syrup a splash of Cointreau and Cranberry Juice. Shake well and strain as you pour into two chilled martini glass. Garnish with Fresh Cranberries and a Lemon Twist. Sip and enjoy! *To make Ginger Syrup, put ½ cup sugar, ½ cup water and 1/3 cup peeled and sliced fresh ginger into a small saucepan over medium heat. Stir until sugar is dissolved and then simmer on low for 30 minutes. Strain syrup and discard Ginger (or save for another use). Let Syrup cool before mixing into cocktails. Store Ginger Syrup in a tightly closed glass jar in the refrigerator for up to two weeks.